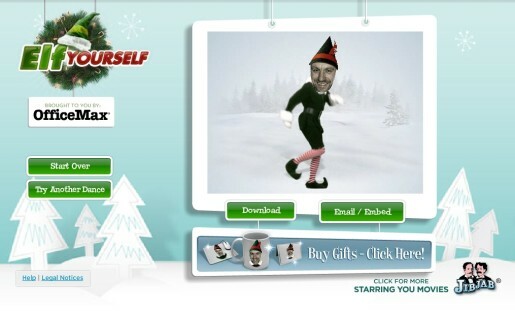 Today’s site of the day is Elf Yourself, an interactive site sponsored by OfficeMax Office Supplies and developed by JibJab Movies. This is the third year in a row that OfficeMax has presented the Christmas shopping site, www.elfyourself.com. The site attracted 36 million unique visitors in 2006, and 193 million in 2007. Visitors can upload up to five photos at a time, aligning faces by angle and scale, before trying out each of the four dance videos: disco, country, Charleston and classic.